And you’re not the first person to say this. My guess is 90% or more of people who did an entire round of P90X didn’t even take a peak at the P90X meal plan and went right into the workouts. You can put me in that boat too. This is one of my favorite Tony Horton quotes and it’s so true. While I did see results from my first couple rounds of P90X I thought I was going to see more. Not in the strength department but more in the mirror department. I was doing P90X every day and didn’t have the definition I was expecting. Little did I know that my definition of eating good was more along the lines of eating ok. I would have to change my approach to eating, learn how to cook better, and be more conscious of what I was putting into my body before I would start to see results. It took me too long to understand how important the meal plans were and I feel this is the same for a lot of people. Making the leap over night to following the meal plans 100% was too big of a challenge. I read someone say to pick out a couple of meals I could cook and make those meals most of the time. So thats what I did. Now I was focused on making a couple good tasting meals most of the time instead of trying to learn a lot of meals. Little by little I was making better food choices through just a couple of meals. If you want to see results from P90X then you have to be using Shakeology on a daily basis. Beachbody didn’t come out with Shakeology until after my first three rounds of P90X but did it ever make a difference. My results from using Shakeology accompanied with eating better and doing the workouts made a huge difference. The good thing was that it was so simple to do. One scoop a day mixed in with good meals made a world of difference. If your one of the many people who did P90X but didn’t get anything out of it then try it again while following the tips above. Accept the fact that you really only put in a 50% effort with the program. 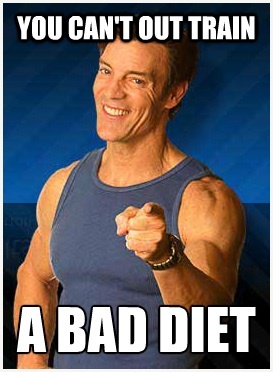 Tony Horton has said that your P90X results are about 70% what you eat and 30% workouts. Knowing that should show you what you need to do to get the most out of the program. No problem. If you don’t like the way the meal plans are set up in the P90X meal plan guidebook then try this out. Create a free Beachbody account first. Then go ahead and click on the “Eat Smart” tab. Check out the meal plan wizard. It lets you pick the kind of meals that will be best for you. What I really like is how they will make up a grocery shopping list for you for the entire week. This will help you out a lot as all of your meals are planned ahead of time. In the end you really need to spend more time focusing on what you put inside your body if you want to change the outside of your body. The P90X workouts will only do so much if you’re not providing the right amount of nutrition the body needs to get the results you want.